We had a good turn out for our AGM, in February, helped as always by our female partners. The Official positions in our Club were left unchanged, but several people offered to assist Jeff in the future outings being planned. It is good to find so many wanting to become involved in this critical part of the club, always made better for different thoughts and idea's. There was a lot of discussion about the runs for this year, and both the Netherlands and Whitby were, high on the list. Both Jeff and Andrew promised more information about, the costs and possible dates. To be given to us before the next meeting, so they can be confirmed in our outing's calendar. 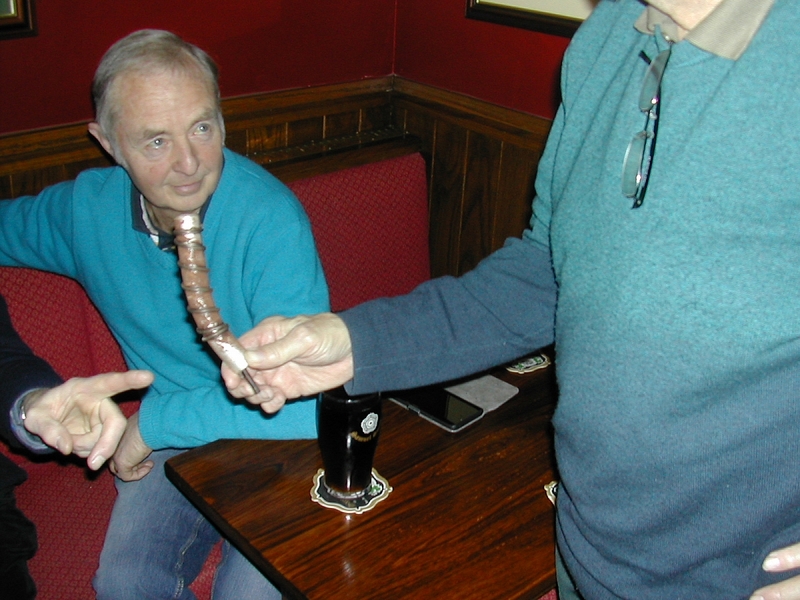 Peter and Brian started the night by giving us a mystery object associated with a TR6. No its not Brian's, head on a stick, that's just my poor camera work. Only James guessed, it quickly, it was the spout of the petrol pump handle, that some how, had became lost in the tank, possibly when someone made a quick get away from a filling station. The Police may still be looking for the car. The engine is back from repair on my restoration and it is just a matter of refitting all the parts, before sending it for painting, but the weather is still cold, for working on it. James made Peter's night by giving him brand new original wiper blades for his six, that he had stored for many years. They were black and not chromed as fitted to his TR4, posh cars.